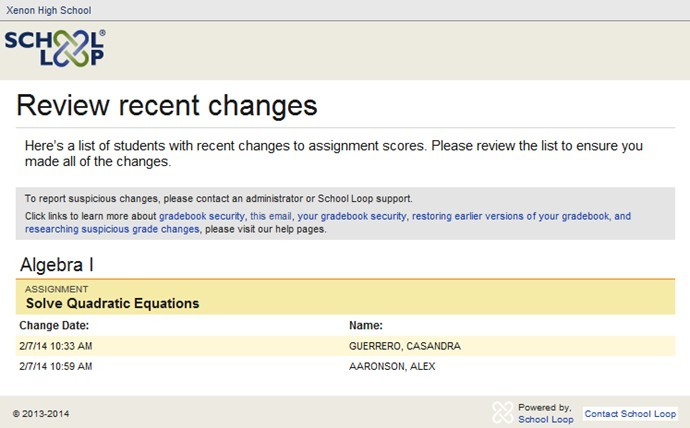 To help teachers easily spot suspicious changes in grades, the notifications only includes changes from one score to another. The initial scores entered for an assignment are not included in the notifications and neither are changes where a score is removed, leaving an empty cell. To report suspicious changes and to get help restoring earlier versions of your gradebook, please contact an administrator or School Loop support. Note: This is a district-wide feature; notifications are enabled for all teachers when turned on. The feature cannot be turned off for a school nor for individual teachers.